Mixing instructions: Mix in a plastic bag or mixing bowl. 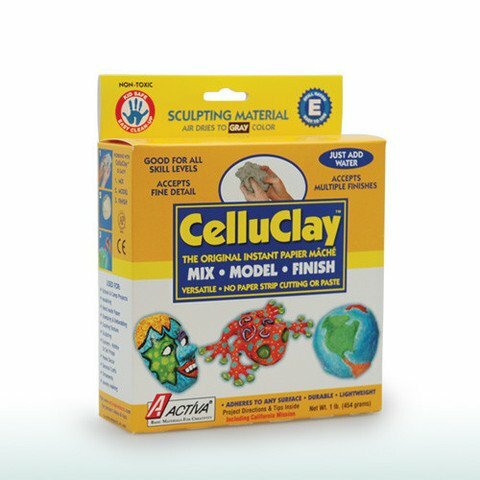 Add 32oz if water to 1lb of CelluClay. Warm water mixes faster. Knead until firm like clay or stiff dough with no dry spots. If mixture is too soft, add more dry mache, if too dry, add water sparingly. For use by very small children, add a few drops of liquid detergent when mixing. Mixed CelluClay in a plastic bag this will keep at room temperature for some time, or indefinitely in a refrigerator. Tools needed: An inexpensive plastic or wood modeling tool, a small bowl of water, and some paper towels, a Formica or waxed paper working surface, and a simple drying rack are the essentials. 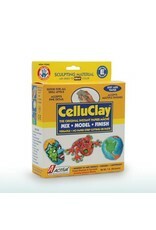 Working with CelluClay: Store in zip - lock bag so it will not dry out. Keep fingers moist but not wet. Dip any objects used for stamping design and tools in water.